"...Monday was apt to be rather a stormy day at the Carrs'. There was the big wash to be done, and Aunt Izzie always seemed a little harder to please, and the servants a good deal crosser than on common days. But I think it was also, in part, the fault of the children, who, after the quiet of Sunday, were specially frisky and uproarious, and readier than usual for all sorts of mischief. To Clover and Elsie, Sunday seemed to begin at Saturday's bed-time, when their hair was wet, and screwed up in papers, that it might curl next day. Elsie's waved naturally, so Aunt Izzie didn't think it necessary to pin her papers very tight; but Clover's thick, straight locks required to be pinched hard before they would give even the least twirl, and to her, Saturday night was one of misery. She would lie tossing, and turning, and trying first one side of her head and then the other; but whichever way she placed herself, the hard knobs and the pins stuck out and hurt her; so when at last she fell asleep, it was face down, with her small nose buried in the pillow, which was not comfortable, and gave her bad dreams. In consequence of these sufferings Clover hated curls, and when she 'made up' stories for the younger children, they always commenced: 'The hair of the beautiful princess was as straight as a yard-stick, and she never did it up in papers—never!'...." We have already met the Carr family in What Katy Did at School, this blog entry (and the hat decorated with soap, sponge and towel is the Clothes in Books avatar). This is much earlier, before the incident which leaves Katy unable to move; and before the later bit memorably described in The Pursuit of Love – this blog entry – thus: “the children… yearned to be total orphans – especially Linda, who saw herself as Katy in What Katy Did, the reins of the household gathered into small but capable hands” (though Katy not actually an orphan). Clover and Elsie are the younger sisters, and this is just about the only difficult or bad thing to happen to Clover ever – she is a bit of a goody-goody, compared with Katy, but really more of a nonentity. Aunt Izzie looks after the children (for now) because their mother is dead. Curling the hair at night pops up in literature now and again - in Dickens and Trollope for example - right up to recent days: the narrator of yesterday’s Hilary Mantel book, An Experiment in Love, also has to pin up her hair in curl papers every night in the 1960s. 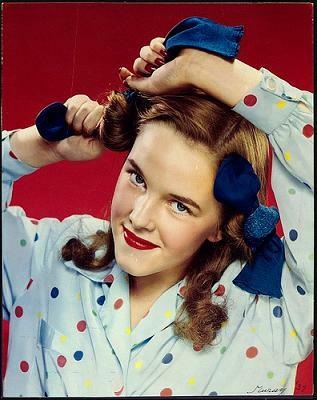 The girl in the photo – a McCall’s cover from George Eastman House, found on Flickr – looks a lot happier than any of them, in her spotty PJs and nail varnish. Hussy.